The next recital organized by the Friends of Music Making in Chiang Mai will take place in the music salon of Anne and Kazuyoshi Murase in Hang Dong on June 10th. The previous recital in May was a stunning success and brought wonderful dynamic musicianship to Chiang Mai – the Friends aim to continue in this manner with a recital by the very talented and already ‘being-talked-about’ nineteen year old Thai pianist San Jittakarn. He is currently studying music on a full scholarship at West Virginia University Faculty of Music, USA, under Dr Peter Amstutz. San is no stranger to Chiang Mai having attended a Festival some five years ago, taking a master class with one of the Festival directors. 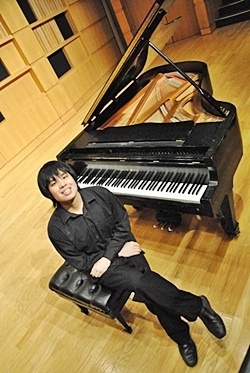 San began studying piano when he was 8 years old at the Nat Music School with Charun Poomiwadorn and Nat Yontararak. In 2006 he was the first prize winner at that school in their piano competition. A year later in 2007, San was accepted into the Music School of Mahidol University on scholarship and studied there with Bakhthiyor Allaberganoff, Sebastien Koch, Ramasoon Sitayalan and Eun-Young Suh. San has also undertaken master classes with renowned international musicians such as Jerzy Sterzinski, Rolf-Dieter Arens, Wolf Harden and Tomasz Herbut. In Thailand, when at home, San is continuing his studies with renowned French concert pianist Sebastien Koch. This young pianist has made great strides musically during the past few years and he is now ranked highly among the better Thai pianists. We are delighted to welcome San back to Chiang Mai after his first full year in the USA and assure him of a warm reception!